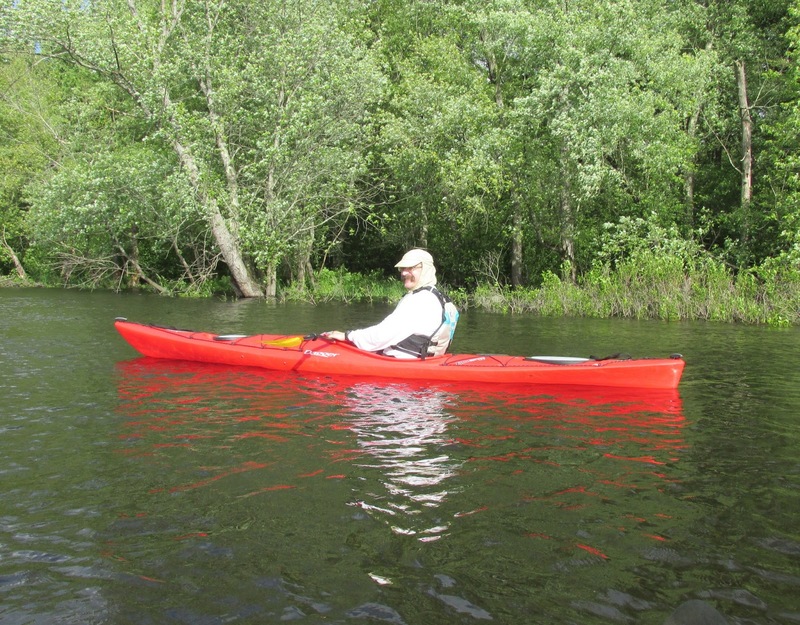 On yesterday's late day paddle down the Sudbury River I was inspired to tweak the old Irish blessing: "May the river rise to meet your paddle, and the wind be always at your back....". Friday night's deluge of rain had the river running at a level more typical of late March, and this allowed access to just about anywhere a paddler wanted to explore. Thanks to a shuttle service provided by Mrs. Trashpaddler, I was able to ride the swift current from Little Farms Road in Framingham down to Sherman's Bridge in Wayland. After launching, however, these water levels allowed me to enter and pass around the nearly mile long oxbow that was once the river's actual course (opening photo). This oxbow, now a sleepy backwater of sorts, provided a tranquil place from which to start my journey. Emerging back into the flow felt like being released from a slingshot, and I soon found myself dodging obstacles of one kind or the other as I rode with the flow. It's an overturned kayak pressed up against a tree. My hope is that it resulted from a boat being left too close to the water's edge rather than an accident. While new to kayaking Chris is no stranger to boats having once sailed across the Atlantic Ocean on a 35' sailboat. I was glad he asked for directions, as I otherwise might have passed downriver without taking advantage of the rare (for this time of year) opportunity to visit the pond via the river. Being out of the current for a bit allowed my brakes to cool down. There were 28 recyclable containers (7 redeemable) and 15 pieces of miscellaneous rubbish.